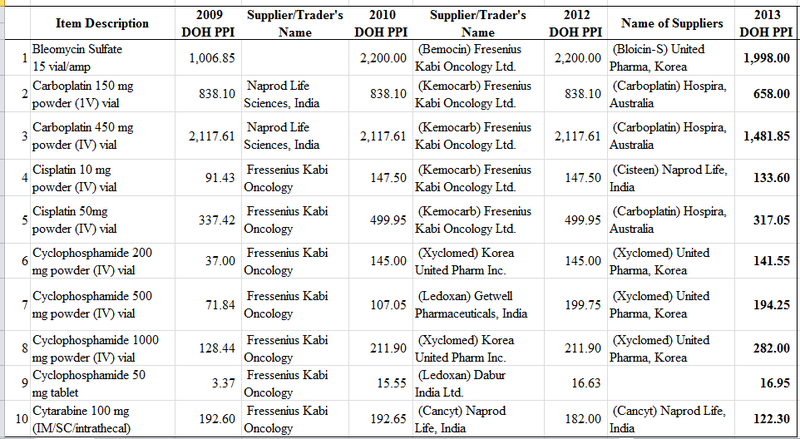 There is a huge price differential (4x to 7x) between those by Mercury/big hospital in the Philippines, and those in India (what drugstore or hospital in India?) for #s 1, 3 and 7. Also big price differential between those in the Philippines and in Thailand and again, what drugstore or hospital in Thailand? 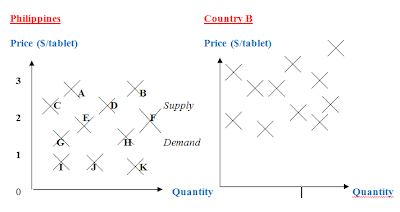 There is NO single price for each country for each medicine or any other commodity. Note #7 though, even the price in Thailand is about 6.5x higher than that in India. 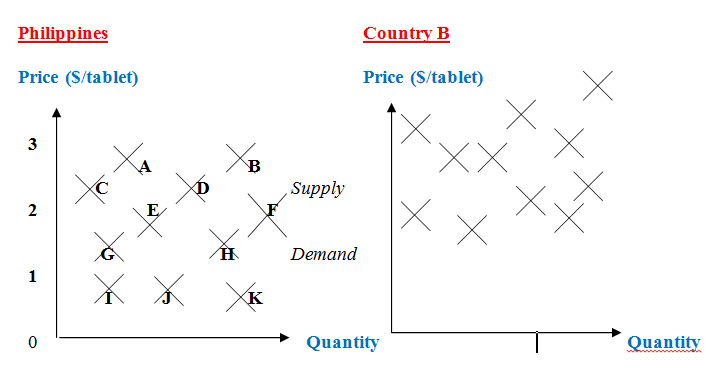 Any of these factors can possibly explain: (a) that medicine is under mandatory and forcible big price control in India, (b) that medicine is subsidized and sold by a government-owned drugstore in India, (c) that medicine is non-patented in India and is manufactured at very low cost by any of its thousands of generic producers, (d) other factors. 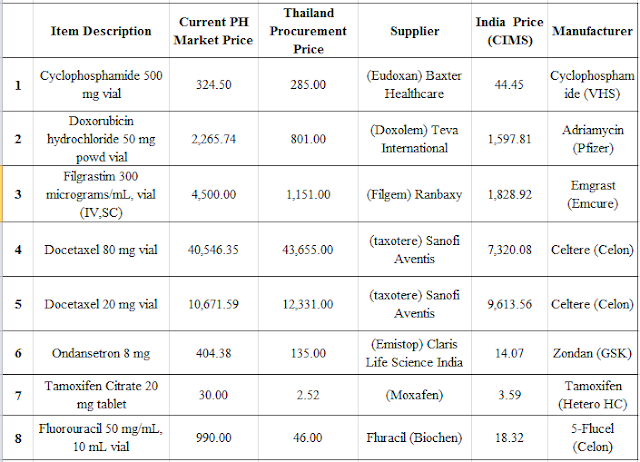 In the second batch of medicines below, note #20, Philippine price is 8.7x while Thailand price is 4.6x higher than that in India. The above possible explanations may also apply here. The price comparison would have been more level or glaring if medicines are bought in the same multinational drugstore, like Watsons. The second list of medicines sent to me by Doc Melissa is for breast cancer. There is a substantial price decline for all the eight medicines except #1, I wonder why since it is the same supplier as in 2012. Maybe a typo error, P94 instead of P194? Below, note #4, Docetaxel 80 mg vial. It was procured by the DOH from Sanofi at only P10,000K per vial last year, then procured from Fresenius at only P5,500 per vial this year. But if one will buy that medicine from Mercury or that undisclosed big hospital, the price is P40,568. Note: #9, Methotrexate 25 mg/mL vial, supplied by (Altrex) Naprod Life Sciences Pvt Ltd., India, has been delisted from the Approved Treatment Protocol. 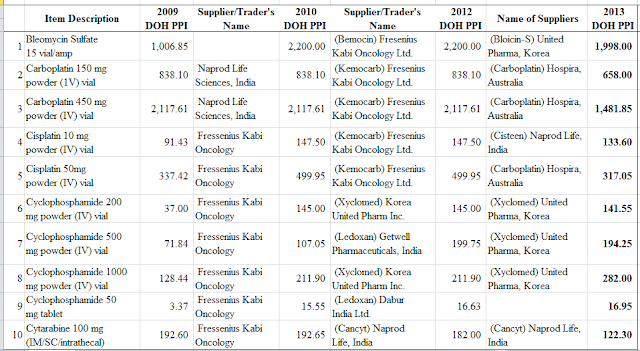 Why a huge price by Mercury/hospital? Only the company can provide the answer/s, but some possible explanations are: (a) Mercury/hospital is selling a new brand by an innovator company other than Sanofi, (b) lots of women senior citizens (automatic 20 percent discount + 12 percent VAT waive = 32 percent mandatory price discount) are buying that drug, so it is passing the price to the non-senior citizens female patients. Or (c) Mercury/hospital simply wants a huge mark up because it is a highly popular medicine. But wait, Philippine price is actually lower than that in Thailand, sold at P43,665. Only India has a low price. One problem in the Philippine health sector is the existence of a black market in medicines dispensing by some Filipino physicians themselves. 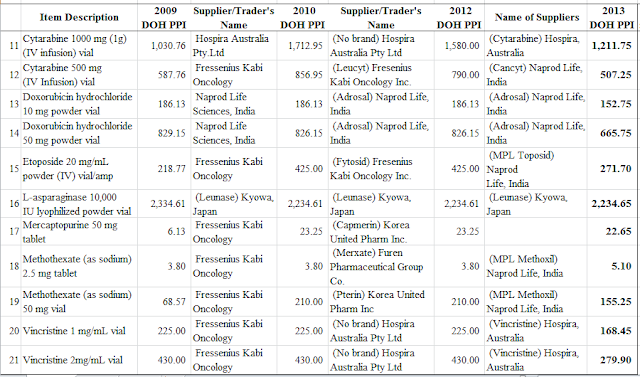 Even the DOH does not know the prices of cancer drugs dispensed by oncologists to their patients. So the price of the same medicine by the same manufacturer can vary from one physician to another. I understand that it is against the pharmacy law, or medical law, for doctors to dispense medicines, they can only prescribe. The DOH considers this case of market failure for some oncology products, so it has created an access program for poor patients. At those prices, even middle class and some rich patients would wish they can get those cheaper DOH-procured medicines. To avoid suspicion that the DOH officials may actually be giving those cheaper medicines to non-poor patients, the DOH should publish the names of the recipient patients. But this will violate patient privacy. Some patients will not admit publicly that they are suffering from cancer because it will affect their career, or might cause depression among some family members and friends, or various reasons. Lots of dilemma indeed. That is why in economic theory, market failure is considered only as a “necessary but not sufficient condition” for government intervention. There are many instances where government intervention actually worsens the initial condition, or a case of “government failure worsening market failure.” So, dahan-dahan, hinay-hinay lang, people should not propose more government intervention, regulation and taxation as if such are just temporary measures that can be discontinued and withdrawn next month or next year when the result is more damaging than being helpful. Finally, we keep hearing from some sectors and individuals that we should emulate India’s pricing as they have among the lowest medicine prices in the world and hence, by implication, people there have better health outcome. Is this so? Check this simple table to separate illusion from facts. Even if medicines are ultra cheap in India, one’s chance of dying young and early is higher there than in the Philippines or in Thailand. There are many factors for better health outcome other than cheaper medicines. But some sectors have taken the ideological position that multinational pharma companies and global capitalism are evil, so the solution is more government intervention, and move to healthcare socialism. 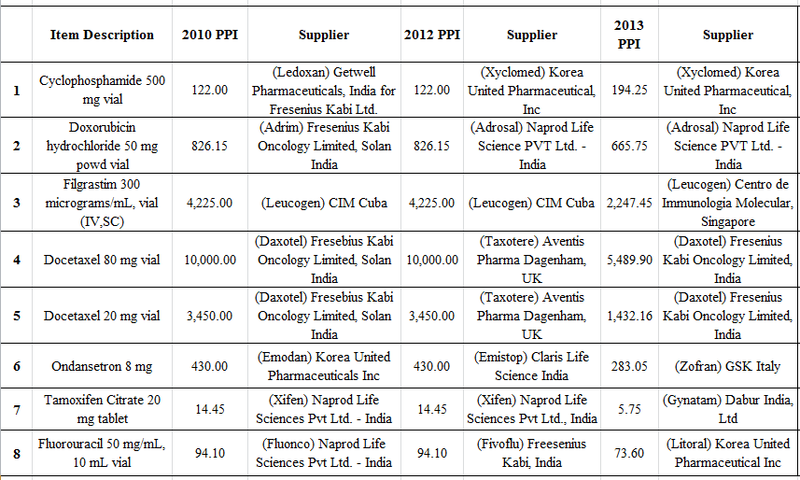 The kind of more government price intervention in medicines is three-pronged One is by expanding the existing drug price control (or maximum retail price, MRP) policy by covering more drug molecules. Two, by expanding the mandatory price discounts for senior citizens and persons with disabilities (PWDs) to other sectors like solo parents. And three, raising the forcible price discounts to 50 or 75 percent for centenarians.. Again, guys, dahan-dahan lang. If you get what you wish for, you will simply regret it because socialism is a lousy, inefficient and dictatorial system that only dictators and highly insecure people would love to become leaders of that society. Back to James Auste of CWF. Yesterday, he emailed to various yahoogroups including CHAT’s, then to all DOH Advisory Council members. He recalled that during the 16th meeting of the Council (February 14, 2013), there was a proposal by some (not all) innovator pharma companies to raise the price of their medicines, at least those not covered by EO 79 issued by former President Gloria Arroyo. He opposed this during the 17th AC meeting (June 14, 2013). Instead, he asked that all multinational pharma companies should submit to the AC their audited financial statements submitted to SEC, to see if they are indeed losing money to justify raising the price of their medicines that were affected by the price control policy. ***LIST GALING SA BIR.GOV.PH! please reply kung di kayo kasama sa nag re request ng price increase! CONCLUSION--MALAKI ANG KANILANG KITA! IN MILLIONS OF PESOS INDIVIDUALLY! COMBINED IT IS A MULTI BILLION INDUSTRY! 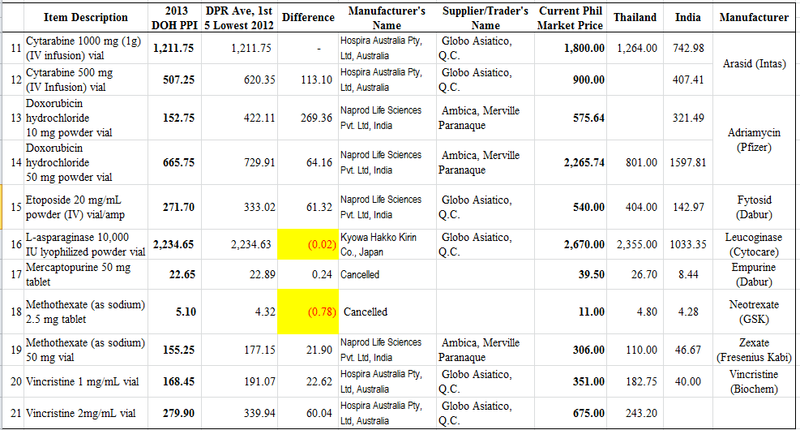 ITO ANG DAHILAN BAKIT ANG PINAS ANG HAS THE HIGHEST PRICE OF DRUGS IN ASIA! AND INCREASING MORTALITY SA DISEASES! KAYA ITO ANG DAHILAN WHY WE DENY TO THE HIGHEST DEGREE ANG REQUEST FOR PRICE INCREASE! CALL-- PANGKALAHATANG PRESYO PARA SA PILIPINO! LOWER PRICES OF MED==MORE SAVINGS=MORE BUDGET FOR OTHER MEDICAL FAMILY NEEDS! 1--MERCAPTURINE TABLETS USED DAILY NG ALL KID FOR 2-3YEARS! BEFORE MDRP MRP 80 PESOS! SA INDIA 6 PESOS LANG!! ITO ANG PROCURMENT PRICE NUNG 2009 NG SINIMULAN ANG PROGRAMA! At the CHAT yahoogroups, I replied to him and pointed out that Unilab is the biggest pharma company in the Philippines. 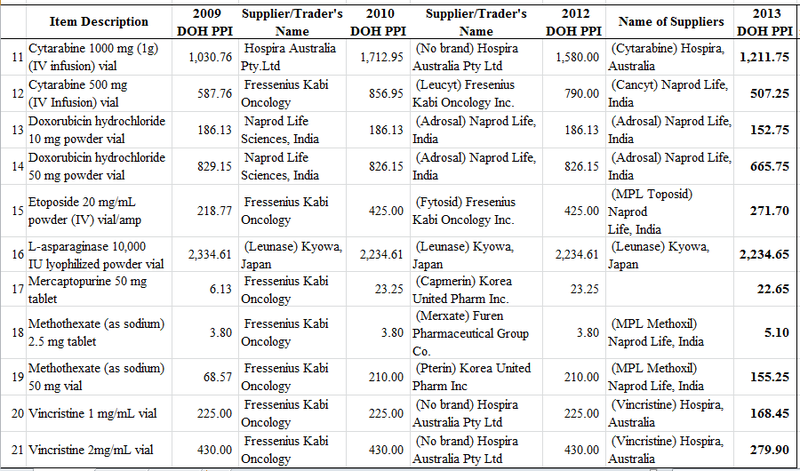 It corners about 25 percent or 1/4 of the total Philippine pharma market. The 2nd, 3rd, 4th -- GSK, Pfizer, MSD I think -- have combined share of around 21 percent or lower than the market share of Unilab. 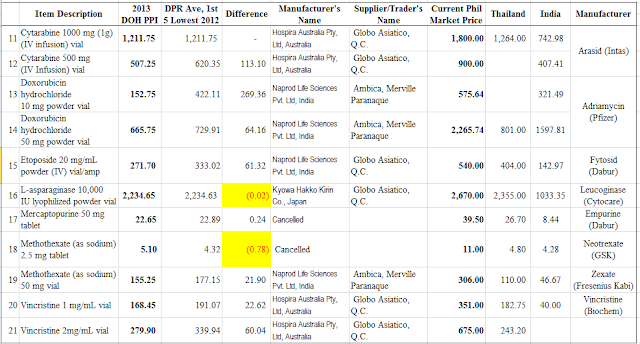 Note also that in his data above, #s 1, 8, 9 and 18 are drugstores, local drug retailers and not multinational pharma companies which are the object of his criticism as having very high revenues. For public interest groups, NGOs and other CSOs that advocate certain policy measures, it would help if they do more serious research before they open their mouth. There are alternative sources of data, like (a) company websites, they normally publish their financial statements; (b) BusinessWorld’s Top 1,000 Corporations, available in bookstores or in some university libraries, (c) SEC, maybe write a formal letter of request, (d) DOH or MeTA Philippines presentation papers, (e) Center or Institute of Public Health in some universities (UP, Ateneo, La Salle, UST, etc. ), others. For patients and other people who keep asking for more subsidies, more welfare from the state, they should be happy and thankful for those big corporate taxpayers, instead of demonizing them. Government is a penniless institution that becomes rich and powerful only from the taxes that it collects from the people, individuals and corporate taxpayers alike. Government price control is wrong. Whether we are talking about cellphones, computers, clothes, mangos or medicines, price dictatorship is wrong. What the consumers should demand from government, is to further liberalize the economy, so that more producers and suppliers, more manufacturers and retailers, will come in and do business in the country. Then consumers will have more choices, more options. If they complain of high prices by one seller, no need to rally in the streets or make political noise and call for government price dictatorship. Simply walk away and go to the next supplier who can sell at a lower price, easy.